There were 690 press releases posted in the last 24 hours and 153,587 in the last 365 days. CLEARWATER, FLORIDA, USA, October 25, 2018 /EINPresswire.com/ -- On Monday the 12th of November the Clearwater Community Volunteers (CCV) Center will host the Boy Scouts of America Troop 313 in their semi-annual Court of Honor, the formal recognition of the scouts. To honor the scouts’ achievements in both community service and the enhancement of their practical survival skills the boys are called up to receive their respective badges and rank advancements. This will be the troop’s second Court of Honor at the CCV Center. A standard Flag Ceremony and Pledge of Allegiance starts the Court of Honor before the lighting of 12 candles representing the 12 points of Scout Law. Later, the scouts are presented their badges and rank promotions are formally recognized before the troop and their proud parents. 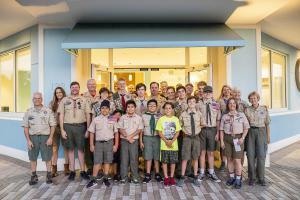 Troop 313 has used the CCV Center as its home since the center first opened on March 24, 2018. Troop 313 is open to boys of any faith, as is any troop. Boys in the Scouting program and encouraged to be faithful and loyal, as laid out in the Scout Oath and Law. For more information about the Clearwater Community Volunteers enter please call Michael Soltero at (727) 316-5309 or email ccvcenter@ccvfl.org.